See the video story from NYC Media. We would love for you to be part of the team at HHC. We offer many opportunities for you to get involved and donate your time and talents to our patients. Spend a few hours every week playing with sick children or reading to elderly patients. Or join our local auxiliary or community advisory groups to help raise funds, support our mission and provide a voice for your community. Our volunteers are valuable members of our healthcare teams, making a real difference in people’s lives. Each year, more than 8,600 volunteers contribute more than 715,000 hours of service to HHC facilities. Volunteers give of their time and talents in countless ways. Some even create special programs that utilize their own special skills and interests. As a bonus, volunteers often find that in serving, they enrich their own lives in unexpected ways. Community Advisory Boards (CABs) are the formal and direct links between each HHC facility and its patients and local advocates. The CABs contribute to planning, program development and service delivery. Members also provide invaluable advocacy and advice from the local community perspective. Learn more about the HHC Community Advisory Boards. 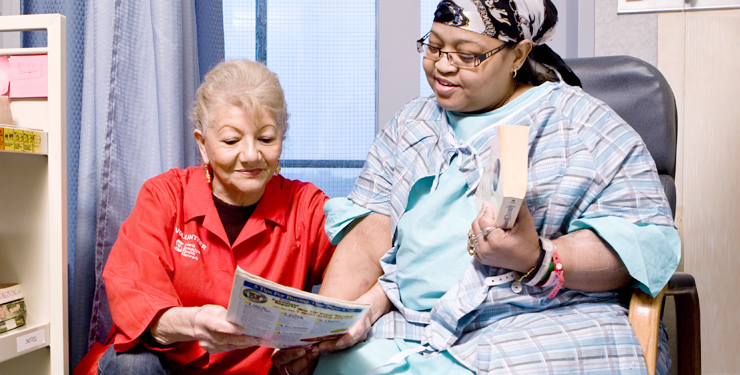 Many HHC facilities are supported by members of an auxiliary, a group of volunteers who work in collaboration with hospital administration to advance the quality of patient care services. Auxiliary members help fundraising efforts to support clinical enhancements, purchases of medical equipment and evaluate requests for other necessary grants that will advance our mission to provide quality health care with dignity and compassion. Contact your local HHC facility to learn more about the auxiliary groups. How can I volunteer at a facility in my neighborhood? Time commitment. We ask our volunteers to commit to a set number of hours per week and to a minimum length of service. This helps us support continuity of services for our patients. Specific commitment requirements vary, but the range is from three to six hours per week for a period of three to six months. Training. Some programs, such as patient advocacy or counseling, require special training. HHC provides the training programs free of charge. These training sessions often give volunteers new skills that are valuable in their professional life. Volunteers who work three consecutive hours are eligible to receive a free meal. Some volunteer programs provide academic credit, if arrangements have been made with your high school or college. Additional benefits may be available at some facilities. There are HHC facilities in every borough of New York City. Find the facility closest to you and call the director of Volunteer Services listed below to arrange for an interview. We can help you find the perfect program to meet your preference and availability.